A doctor by profession, Dr Abha Jha has 20 years of working experience in the healthcare sector. She started her career with St Catherine Hospital (a mission hospital at Kanpur) where she gained valuable clinical experience and expertise in community healthcare. Her deep understanding of the multi-faceted nature of community healthcare enables her to analyse, interpret and apply technical expertise on health problems keeping cultural aspects in mind. Her ability lies in prioritising health problems through design, implementation and evaluation of appropriate healthcare interventions. 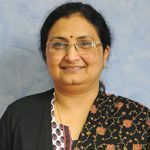 As an active member of the Indian Medical Association (IMA) and the Federation of Obstetric and Gynaecological Societies of India (FOGSI), she advocates for empowering and equipping the health micro unit at community level. She has in the past been associated with several reputed organisations such as Population Services International (PSI). In her current assignment as National Manager, Medical Services at HLFPPT, Dr Jha is responsible for providing technical assistance to various ongoing programmes on health and family planning. In order to build an effective mechanism for improving quality of care, she articulates a clear vision to develop dynamic framework for Mother & Child Care and Family Planning services. Dr Jha holds an MBBS Degree and a Diploma in Gynaecology & Obstetrics.